Painting Acrylic on Canvas | 84" x 60"
Painting Acrylic and Oil on Canvas | 24" x 30"
Painting Acrylic and Oil on Canvas | 30" x 40"
Painting Acrylic and Oil on Canvas | 30" x 30"
Painting Acrylic and Oil on Canvas | 15" x 15"
I bring you faces, I bring you stories. In these spaces and lines, if you notice closely; tiny specs of life hide and echo folklores. I am inspired by our society, everything that pulls the thread which weaves us into one whole complex existence. My motifs, my themes differ from time to time, but often it happens to be women. The ineffable spirit depicted in her effortless, beautiful form. I try to tell my viewers untold tales through every painting. With each pair of eyes I paint, I wish to take them to a whole different world. 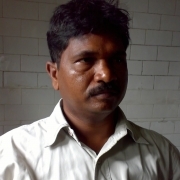 Dayanad kamakar is a resident of Dharwad. He earned his Diploma in Art Master and Fine Arts from Hampi, Karnataka. Ever since he started his career as an artist, he has not only been a part of several group and solo shows, but is also the recipient of numerous awards such as Karnataka Lalit Kala Academy Award, Karnataka, Vishwa Karma Samaj Seva Sansthe, Shirsangi. He has also participated in Art shows and camps across the country. Mr. Kamakar’s paintings are part of collections throughout India and in many European countries as well. His style and composition are as unique as his themes and motifs. Each painting stands out, with its own distinctive presentation. He says he is inspired by the society that surrounds him. His patterns often leave the viewer mesmerized. The abstract lines add a transient flavour to his work.